Today’s paper examines the phenomenon of extended main sequence turn-off (eMSTO) in a galactic open cluster – NGC 2818. To do this, the authors make use of Gaia DR2, the data gift that keeps on giving, along with archival VLT/FLAMES spectroscopy. Let’s first unpack the acronym, eMSTO, before we delve into the new results. Think of your standard Hertzsprung-Russell (HR) diagram. The main sequence is a distinctive band of stars that appears on the HR diagram. Stars evolve away from the main sequence when they exhaust the hydrogen fuel at their cores. The point at which this occurs is called the main sequence turnoff. In general, the more massive a star is, the faster it leaves the main sequence. If we look at the HR diagram of a stellar cluster, assuming all the stars in the cluster were created during one burst of star formation, heavier stars will evolve away from the main sequence as the cluster ages. This gives us a way of estimating the age of a stellar cluster by looking for the turnoff point! If we were to see, for example, an HR diagram for a cluster where no O-type stars are present on the main sequence but a lot of B-M type stars are still on it, we would know that it is a very young cluster. That’s all about main sequence turnoffs, but what about the “extended” bit? An extended MSTO is an observational feature where the MSTO of a cluster is more extended than what you would expect for a simple population of stars. An example is shown in Fig. 1, which also appears in this astrobite along with a nice explanation! Figure 1. A color-magnitude diagram (CMD) for an example star cluster with an extended main sequence turnoff (eMSTO). Notice the spread where the black lines curve upward at (B-R)~1. For a simple stellar population, this strip would be much narrower. So the question is: What is behind this effect? Large actual age spreads within the clusters were suggested as the origin of eMSTOs. Another suggestion links the eMSTO width to the cluster mass, broader for higher mass clusters. However, there is also observational evidence that stellar rotation is related to position within the MSTO. This is the explanation favored by today’s paper. eMSTOs in clusters have previously been studied mostly in young and intermediate age massive clusters in the Large and Small Magellanic clouds (LMC and SMC). 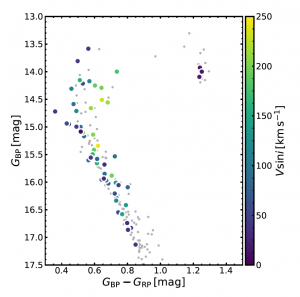 The authors of this paper study a galactic open cluster which displays this phenomenon. An open cluster is a group of stars that formed out of the same giant molecular cloud, with roughly the same age, loosely bound together by gravity. Over a thousand open clusters have been discovered within the Milky Way. NGC 2818 is a relatively low mass cluster (~2400 Msun), about 800 Myr old. Using Gaia DR2 proper motions and parallax measurements, the authors were able to select a clean sample of cluster members. This is really great because the stars in open clusters are a lot brighter than their SMC/LMC counterparts and detailed follow up studies can be done. Also, they present a different metallicity environment that can be probed, in addition to SMC/LMC metallicity. Figure 2. Upper left: Proper motion of all stars within 15′ of the centre of NGC 2818, note the over-density of points belonging to cluster. Upper right: Spatial distribution of all stars, cluster members are marked by red points. Bottom left: Parallax distribution of all stars in black, cluster members in red. Bottom right: CMD of all stars, cluster members again marked by red points. Figure 1 in the paper. Fig. 2 shows the proper motion map of stars close to the centre of NGC 2812, constructed using data from the Gaia DR database. Further cuts in parallax were applied for the final selection of cluster members, but we can clearly see a denser region of stars belonging to the cluster. The color-magnitude diagram (CMD) of cluster members shows an extended main sequence turnoff (at 14.5 mag). Medium resolution spectroscopy data for main sequence and turnoff stars in NGC 2818 is publicly available. The authors compared synthetic (from models) and observed spectra to determine rotational velocities of the cluster stars. In Fig. 3, the CMD is plotted again along with rotational velocities, where yellow represents rapid rotators and dark blue represents slow rotators. From the figure, we can see that rapidly rotating stars are preferentially located on the red (cool) side of the MSTO, while slow rotators are closer to the blue MSTO. Rotation affects the color of the stars and rotational mixing can lead to more fuel being brought down to the core, extending the duration of main sequence burning. Figure 3. The CMD of NGC 2818 showing the rotational velocity of each star through color coding of the points. The slowly rotating stars tend to be on the blue side of the eMSTO while the rapidly rotating ones tend to be on the red side. Figure 2 in the paper. 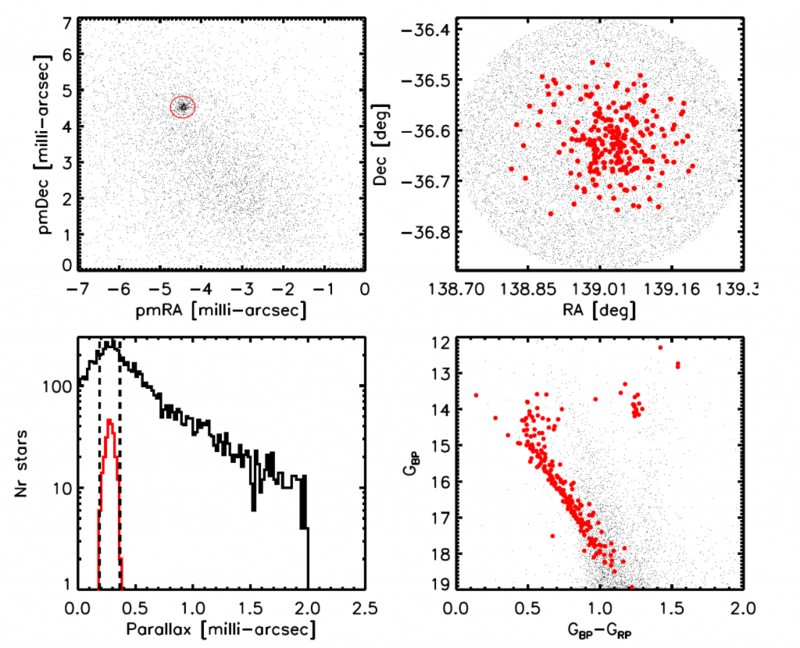 These observations are consistent with predictions of synthetic cluster models that include stellar rotation, suggesting that rotation is the likely cause of the eMSTO phenomenon. Gaia DR2 has given us the ability to select extremely clean samples of cluster members, which is really exciting. In fact, this paper is the first in a series of papers that will study a sample of open clusters available in the Gaia data release, so stay tuned for more interesting results!